...KSB Pumps & Agriculture Solar Powered Water Pump Power Increases Efficiency, Lowers Costs and Maintenance. Energy. Natural. Endless. One of the greatest challenges of our time is to balance a growing demand for energy with the need for greater environmental protection. KSB Pumps and Agriculture Solar supports this development by providing innovative, efficient and durable components for renewable energy applications. Generate natural power safely and economically with pumps and systems from KSB Pumps and Agriculture Solar. 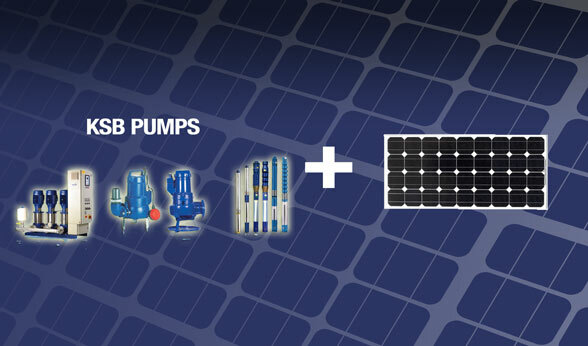 KSB Pumps and Agriculture Solar provides reliable solutions for water pump systems and solar power. With approved pumps and energy as reliable as the sunrise, KSB and Agriculture Energies is ready to support the future of energy. In order to convert solar energy into usable electricity, compatible pumping systems are required that are capable of handling extreme operating conditions. At Agriculture Solar, KSB Pumps and Agriculture Energies can be your simple water pump solution. KSB has been in the business of producing pumps for 140 years. The many years of experience in power technology and extensive investments in research and development enable us to supply optimized pumps for low life cycle costs and top performance. We draw on all our strengths to support our customers with safe, efficient and sustainable solutions. Agriculture Energies systems have been dedicated to modern agricultural irrigation and successfully active in the top irrigation fields for over 10 years and continues to bring the tried and true principles and advantages of solar hybrid power. Think about it, and then make your move. Let KSB Pumps and Agriculture Solar water management provide you with decades of reliability and lasting value. We invite you to explore the possibilities of our reliable hybrid solar powered pump solutions.